2001 � In the closed season at the start of 2001, in the days when your computer made horrible noises to connect to the internet, was very slow and there wasn�t as many stock car sites as there is now, I clicked on a link on Matt Bull�s website for �create your own website�. 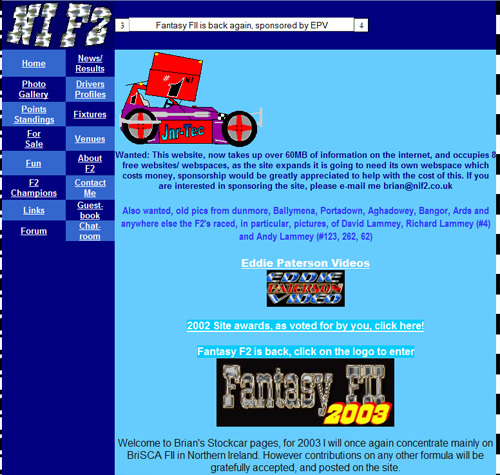 Although I hadn�t any idea of what I was going to create I liked the idea of creating my own site, and so followed the link to setup a site and as a lifelong F2 fan it seemed like the obvious choice, and so Brian�s Stockcar Pages was born. Around the same time Kevin McQueen had created his site which went on to become Racewall.net and a site called Around the Pits was one of the best sites for F2 photos, Rolling Start and Rogers Oval Racing Pages (now ukovalracing.info) where already there. The site focused on F2 racing, I attended most of the Nutts Corner Raceway meetings and the odd meeting at Ballymena, I think Aghadowey had already closed by 2001, and I rarely ventured to Portadown, they�d no F2�s. Armed with a �30 35mm film camera I probably took no more than 100 photos throughout the year, and the one night I did borrow a digital camera I took 4 photos with it. 2002 � Everything was a learning curve to me in 2001, so in 2002 I built a better site, I included more information about the other classes, mainly the product cars at Nutts Corner Raceway and just other bits and pieces I scribbled down along the way. I was now armed with my first digital camera, a 1.3 megapixel Agfa camera with no digital screen, and a 64MB memory card which cost me �100 (that�s �1600 per GB of storage, 1GB is now around �2.50 depending on which cards you use). In August of 2002 I bought the domain nif2.co.uk and the site was rebranded. 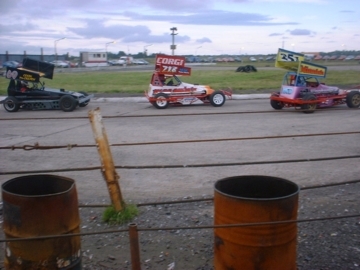 2003 � With Portadown closing at the end of 2002, The old Nutts Corner track that many of us stox fans loved was replaced with the new track which is there now. Many see this as the ruining of the track, but if it hadn�t have been done then, I reckon the health and safety wombles would have it closed by now. This new era had brought the saloons to a Wednesday night, and a Saturday night�s racing became closer to home, so I took in a few of those meetings as well. 2004 � The site was going from strength to strength, I was not only writing for the site but also for Oval Racing News and I think a few bites and pieces for unloaded 7.3. Colin Adair was now providing coverage and meeting reports from the Ballymena meetings and everything but Saturday nights was pretty much covered. 2005 � In 2005 Tony Loftus came out in a F2 with nif2.com across the front of the bumper, while the advertising was great and an honour that people thought highly enough of the site to put it on their car, at the time I only owned the .co.uk domain, and so I had to rush home and buy nif2.com one night after the racing, nif2.com was born. 2005 also brought the first the first Speedweekend to the country, there was a lot of hype surrounded the 2Litre Hot Rod world final that year, and a great crowd turnout of cars and drivers brought about one of the best weekends of racing the province has staged. 2006 � In 2006 the site split up a bit, Simon Kennedy was now looking after the hot rod end of things with NIRods joining NIF2, and NIOvalRacing.co.uk was born to take on the domestic classes, the aim was now to cover everything. Also in 2006 Ballymena Raceway and Nuttscorner Oval launched their own sites, and now geared with a top end digital camera, I got an infield spot at Nuttscorner Oval, although I was still an F2 fan first and foremost and didn�t make all the Nuttscorner Oval meetings. 2007 � In 2007 the intention was to go on doing what I�d done before, but a tongue and cheek comment at the gate of Nutts Corner Raceway on the night of the Saloon Irish Open, knocked that all on the head. I was given my money back and told never to come back to Nutts Corner Raceway. 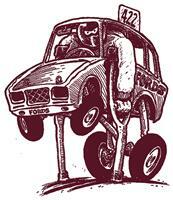 F2�s are a little hard to cover when you can�t go to the track that holds the majority of the meetings. Throughout 2007 I continued to try and keep the site up to date and going, but decided in the end it was time to stop supporting those who didn�t support me, and why should I have run a site out of my pocket to fill someone elses? 2008 � In early 2008 the site just lay as a hosting page, I continued ignoring e-mails asking about the next DD, and I continued working along with Nuttscorner Oval. By the end of the year I�m built the site back up into a photo site, and uploaded some of my stuff to it. 2009 � Throughout 2009 I continued adding photos to the site when I got a chance, but not to the same scale as I would have sent them elsewhere. 2010 � For most of 2010 The site lay untouched, always a project that I meant to get back to. I wasn�t quite sure what I wanted to do with it, and so did nothing.